The Tampa Bay Lightning have signed center Tom Pyatt to a one-year, two-way contract today, vice president and general manager Steve Yzerman announced. Pyatt, 5-foot-11, 186 pounds, played in 61 games with the Montreal Canadiens last season, recording two goals and seven points with 65 shots on goal. He averaged 10:38 in ice time per game. Pyatt ranked fourth among Canadiens forwards for blocked shots with 34 and won 50 percentage of draws taken (55-110). He also played in all seven Montreal playoff games in 2011. 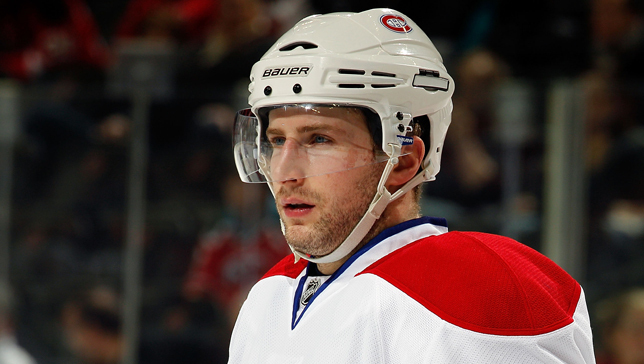 Pyatt has played in 101 career NHL games with the Canadiens during the past two seasons. He has recorded four goals and 12 points in his career with 19 penalty minutes. He played his first NHL game on November 5, 2009 at Boston. Pyatt also played in 25 Stanley Cup Playoff games with two goals and four points, averaging 12:10 in ice time. A native of Thunder Bay, Ontario, Pyatt has played in 156 career AHL games with the Hartford Wolf Pack and the Hamilton Bulldogs. He has registered 32 goals and 83 points. Pyatt set career highs in 2008-09 with 5 goals and 37 points in 73 games with Hartford. Pyatt played junior hockey with the Saginaw Spirit of the Ontario Hockey League from 2003-07. During his career in Saginaw Pyatt accumulated 94 goals and 200 points with 82 penalty minutes. He also played in 10 postseason games, notching four goals and 11 points. Pyatt was given the William Hanley Trophy as the most sportsmanlike player in the OHL in both 2006-07 and 2003-04. He was named to the Western Conference All-Star team on two occasions, including being named MVP of the game in 2006. Pyatt was named the best defensive forward in OHL’s Western Conference during the 2005-06 season. Also during his junior career, Pyatt established himself in international competition, representing Canada in both the 2006 and 2007 World Junior Championships, winning the Gold Medal in each. He was named Canada’s alternate captain during the 2007 competition. Pyatt also participated in the World Under-18 Championships in 2005, earning a silver medal. Pyatt was drafted by the New York Rangers in the fourth round, 107th overall, of the 2005 NHL Entry Draft. He was acquired by Montreal, along with Scott Gomez and Michael Busto, on June 30, 2009 in exchange for Chris Higgins, Doug Janik, Ryan McDonagh and Pavel Valentenko.